Morning Paper: Bakery in North Beach, San Francisco, CA. 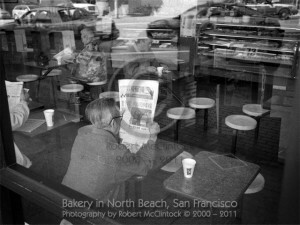 Photography by Robert McClintock, Copyright © 2000-2011 by Robert McClintock. Each year my friend Fred and I make the annual pilgrimage to San Francisco, California for the Macworld Expo. Fred spends the entire day there, literally viewing and questioning (nearly) every booth and vendor. After I take a perusal to see what might be new and “necessary” in the world of photography, I exit to the streets and the people and the incredible sites of that amazing city. Typically, I canvas an area of about 15 square blocks. These are great opportunities for black & white film photography and usually I take my fully manual Nikon FM3a in order to fully immerse myself in “old school” photography. Sometimes I take my smaller digital Nikon, the D200, which affords me almost infinite shots, built in filters (white balance), and built in ISO choices to accommodate late afternoon and evening shots. Sometimes I convert them to black & white when editing on the computer, but the experience and results are just not the same. Considering the cost of film, the limited flexibility in changing light because of a fixed ISO for the roll of film, and the limited number of frames to shoot, digital might seem like a more logical way to go, and often it is. But I go for the experience as much or more as for the results. In today’s world, photographers have the luxury of shooting with traditional film, scanning the image into a digital file, and then doing the “dark room” work on the computer, but with greater precision and detail. The merging of analog film camera with digital editing, to me, is a perfect match. This entry was posted in Adventure, Commentary, Documentary, Exploration, People, Photography, Quest, Travel by Vanessa. Bookmark the permalink.